The legend of the Argonauts describes the pursuit of the Colchidians after the ship Argo and the Golden Fleece. The subjects of the king of Colchis gave up further pursuit after the death of their king’s son. Fearing that they would be punished for his death and the failure of the quest if they returned to Colchis, they decided to settle where the prince had died. Pula therefore became not only a harbor of refuge to the Colchidian fugitives, but also their place of exile. The most famous geographer of the antiquity – Strabo – claims that this is how Pula was founded and according to this legend, it was about three thousand years ago. In the Roman Imperial period (1st – 3rd centuries) the greatest classical monuments in Croatia were built in Pula. The most magnificent and surely central classical monument is the Amphitheater popularly called the Arena. This Amphitheater, used for fights and battles of men and animals, was built in the 1st century AD, during the rule of Emperor Vespasian. The ground plan is elliptical, its size being about 130 m x 105 m, and 32 m high, which ranks it as the sixth largest Roman amphitheater existing today. The Arena could once hold up to 23,000 spectators, whereas today it can seat some 5,000 people. In the second half of the 6th century the Slavs began their invasion of the Istrian peninsula, and after dreadful fights the population declined while trade and manufacture came to a standstill. The new rulers of Istria, the Franks, brought with them the new feudal system which enabled the settling of Slav, Croatian farmers, but brought about the resistance of Istrian towns. With the development of feudalism and the establishment of city-states on its territory, Istria faced the arrival of Venice. In 1150 Pula swore allegiance to the Republic of Venice and accepted all the obligations towards it – to pay tribute, to build and equip galleys, to support it in wars, etc. After the revolutionary year 1848, the Austro-Hungarian Empire realized the importance of Pula’s harbor and started an intensive development of a huge naval port and shipyard. This resulted in the gradual settlement of Pula and within 50 years the population increased from 1,126 people to about 40,000. Pula was still described as a village cut off from the rest of the world, but later on vast sums were invested in the sewage system and infrastructure. Eventually the investments transformed rural Pula into a prosperous town. With the new railway Pula gradually took over the role of Trieste and Rijeka as the main port for Dalmatia. This enabled Pula to develop two functions at the same time – the military and trading one. Under the protectorate of Vienna the official language in Pula was German, but Italian remained the everyday language in use among numerous social classes, while the use of Croatian very soon completely disappeared. Such was the situation during World War II under the fascist rule, when Pula, as an antifascist town, organized its battle for the future under bomb raids and devastation, as well as reprisals over the historically defeated side. 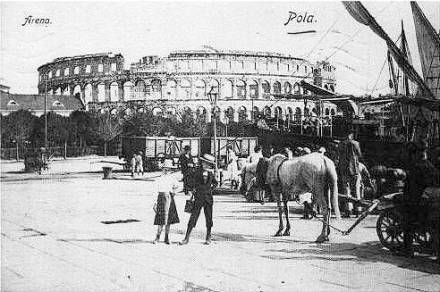 After the War and German occupation Pula came under the Anglo-American administration. In 1947 Pula finally turned to its natural hinterland – Croatia (according to the 1943 Resolution that defined Istria as a part of Croatia), and therefore Yugoslavia. This caused still another exodus of the malcontent domiciliary Italian citizens. It marked the beginning of a new period in the history of Pula that lasted until Croatia gained independence.